I finished university almost 6 years ago now. In that time I’ve had 4 jobs and done two different roles at my current place of work. They’ve all been quite similar jobs and shock horror, none of them require a degree. Do I get paid a good wage? Not at all. Is my job in anyway related to what I studied at university? Nope. Am I happy? Yes, very. And that’s the key. 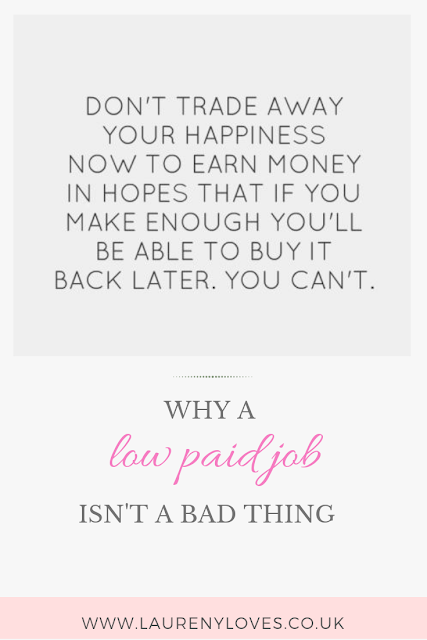 Here's why my low paid job has far more positives than negatives. Lets start with a bit of background, obviously I'm not going to go revealing exactly how much money I earn nor am I going to give away too many details about my job. Money is a sensitive subject but I want to be honest. I'm hoping you know from my many money saving posts that I'm always upfront and open and this post won't be any different but lets get down to it. I work in a school, I've worked in education for 5 years now in 3 different schools as well as a brief period of doing supply work and at my current school I've worked in two different roles. All of my jobs have been pretty similar. None of them require a degree despite the fact I have one and none of them have been well paid. The role I'm currently in is the best paid one of the lot but lets not get carried away with ourselves here, I'm not earning a lot of money by any stretch of the imagination and part of the reason I currently have more money is because my job is within walking distance so I'm not paying for transport either. My hours are classed as part time which also lowers my wage. 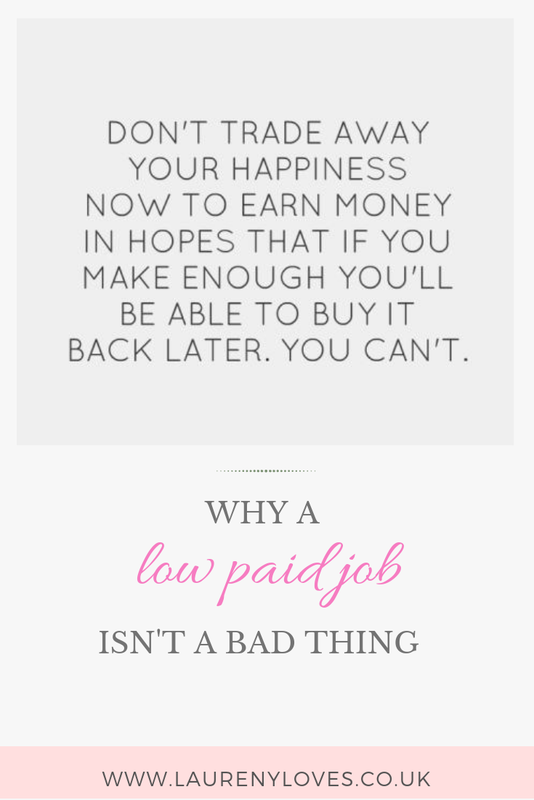 Don't get me wrong in the last 5 years I haven't always been happy in my job, supply work wasn't for me but it was a necessity at the time, I started off mostly enjoying my last job but ended up really unhappy by the end and the first role I had at my current school really wasn't for me at all. But the role I'm doing now? I love it! How many people can genuinely say they enjoy their job? I'm guessing not all that many. My job allows me to own a home, a home I bought at 24 years old, allows me to decorate and renovate the way I want, to save for holidays but more than that it’s also a relatively stress free job, it’s fun, every day is different, each job I've had in the last 5 years has allowed me to learn and experience things I never thought I would, all without using my degree. I now have a speech and language qualification and I taught myself to read and write Braille and passed the exam with flying colours (learning to Braille was something I needed in my last job). I get time to pursue hobbies and read books with plenty of time left in my day to do so after work and usually without feeling worn out. Who wouldn’t want all that? That heatwave we had back in 2018, I got to enjoy that to the max. On average I'm home from work anything between 3.30 and 4pm on an average day which gives me so much time to enjoy things outside of work. I'm rarely in a bad mood after work and it's not often that I feel too tired to do anything. I've never experienced this and I love, right now I wouldn't want to trade that for anything. What about earning more money? Of course there are occasions where I think it'd be nice to have a bit more money. But you're not telling me that someone who earns, double, triple what I earn doesn't think the same, because they do. 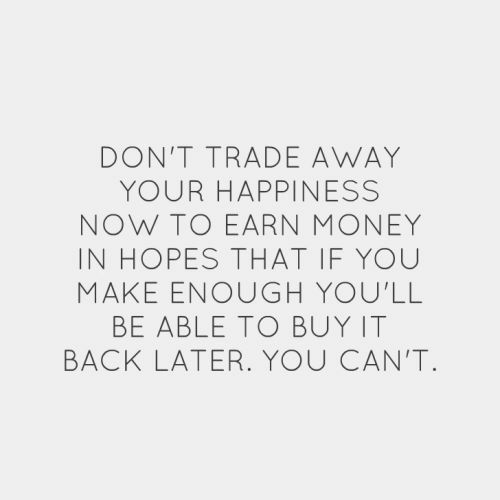 It's always easy to want more than what you've got. I have to save hard for the things I want and that's OK because the satisfaction I get from being able to that is bloody great! I don’t know where I’ll be in 5 or 10 years time but I have no immediate plans to move jobs. Jobs I could do like grad schemes or teacher training don't interest me in the slightest. See that bit above where I said I’m happy? Why would I change that for something I currently have no interest in? I wouldn't not even for more money. But you could do so much more! Oh if only I had a pound for every time the suggestion that I be a teacher has been raised in the last 6 years then I’d probably be rich enough to retire right now! Joking aside though, having a degree and already working in school does not make me want to teach. I have no desire the enter into that world. At all. And nope, 6 years on I still haven’t changed my mind and it’s unlikely I ever will. The long and short of it is, if you love what you're doing then that's great and it is nobody's place to tell you that you should be doing something different. I know I’m not at all in a minority of people who don’t use their degree or who are in a job that doesn’t require a degree even if they went to uni, and I don’t want anyone to ever think that that matters, because it doesn’t. If you are happy, that’s what matters. Stand by your decisions and continue to be happy. I could walk into a job tomorrow that pays double even triple what I earn now and while I'm sure I'd be extremely pleased with the money I probably wouldn’t be as happy as I am now with my work-life balance. There’s more to life than money, god the events of the past year have taught me that big time and while ever I’m earning enough to pay my bills and have fun I don’t need anything more.